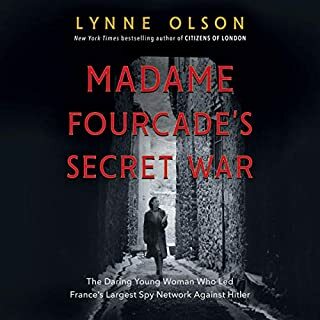 Madame Fourcade’s Secret War is a compelling story of the heroism of the many members and leaders of the Alliance, an intelligence network which acted with MI6 in its arduous resistance to the Nazi Occupation of France. The honoring of women such as Madame Fourcade and Jeannie Rouseau whose contribution to victory was enormous is an objective of the book which is convincingly achieved. I couldn’t stop listening. It is no Hollywood tale, as it profiles the lives of many heroic agents who suffered needlessly tragic fates after capture. I haven’t listened to other books read by Kimberly Farr, but in my opinion the reading was excellent. Facts are and must be the coin of the realm in a democracy. Unfortunately, for citizens in the United States and throughout the world, distinguishing between fact and fiction - always a formidable challenge - is now more difficult than ever, as a constant stream of questionable information pours into media outlets. Lewis argues forcefully that while data points and factoids abound, it is much harder to get to the whole truth of complex issues in time for that truth to guide citizens, voters, and decision makers. This book is about the vital relationship between investigative journalism and a meaningful democracy. Besides giving an incisive overview of contemporary journalism, highlighting the social importance of journalism in creating awareness about racism, the dangers of tobacco, the lies that make war possible, and accurate knowledge of the state of society, it is a homage to the stubborn courage and tenacity of investigative journalists. He sketches the many journalists who have sought independence in order to maintain integrity, such as George Seldes, I.F. Stone, Morton Mintz, etc, while highlighting the career of Edward R. Murrow, who as a mainstream journalist of WWII in the 40s achieved the pinnacle of respect from governments and CBS, but who lost support when in the McCarthyist 50's, political conformity and commercial considerations outweighed the need for the public to be informed. Lewis's own experience working on 60 minutes, when he felt corporate loyalties would conflict with the freedom to investigate news stories. This inspired him to leave corporate journalism and strike out on his own, and found the Center for Public Integrity. Though the Center's history provides a practical example of how investigative journalism could be supported by an institutional framework without sacrificing integrity, this audio book becomes a rather dry listing of accomplishments,drawbacks, and associations. It provides important reference material and leads, the type one would like to read, but not necessarily what one would like to listen to, nor are the acknowledgements. 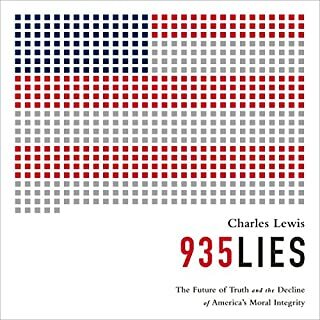 Therefore most of the appeal of 935 Lies as an audiobook is in the first seven chapters, and in its concluding chapters on the possibilities of investigative journalism. Lewis's reflections on the historic potential and limitations of TV journalism, and the emerging possibilities of news gathering in the fast changing information age isn't academic, he has practical solutions. Lewis suggests that a new multi-disciplinary academic discipline be created: accountability studies. The lack of accountability of public institutions is an ever increasing threat to the public good, and Lewis provides the germ of a remedy. Much of this tacitly assumes that investigative reporting will not have large audiences in the future, but niche audiences. Yet this is a limited remedy in a mass democracy where authority to formulate policies goes exclusively to the winners of elections,and the corporate interests they usually represent. Is there anything new to say about Thomas Jefferson and slavery? The answer is a resounding yes. 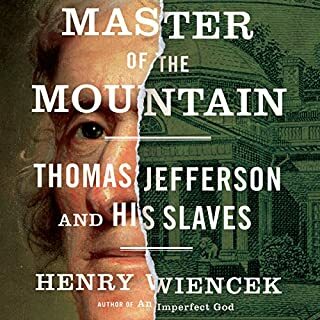 Henry Wiencek's eloquent, persuasive book - based on new information coming from archaeological work at Monticello and on hitherto overlooked or disregarded evidence in Jefferson's papers - opens up a huge, poorly understood dimension of Jefferson's world. We must, Wiencek suggests, follow the money. Master of the Mountain is more than a study of Jefferson and his treatment of his slaves. Jefferson defined the aspirations of liberty and human equality of the American revolution. But his ability to give expression to those worthy aspirations contrasted sharply with exploitative and oppressive practices that he quietly encouraged and in some ways made unavoidable by his reluctance to regard the enslaved as anything but property, (with few exceptions). Part of this story is the running, building up and financing of Monticello. Another part is his relationship with Sally Hemings. Still another part of this story, is how historians have colluded to burnish Jefferson's image, by sanitizing accounts of his relations to his slaves, and his policies. How the relationship between Hemings and Jefferson became practically irrefutable is explained (I was not previously aware of the controversy). The treatment of this relationship by biographers since Jefferson is related, but especially the story of the breakthrough in the 1990s, is told, and is fascinating in itself. The narration was excellent. I couldn't put it down. John Adams told Thomas Jefferson that “history is to ascribe the American Revolution to Thomas Paine.” Thomas Edison called him “the equal of Washington in making American liberty possible.” He was a founder of both the United States and the French Revolution. He invented the phrase, “The United States of America.” He rose from abject poverty in working-class England to the highest levels of the era’s intellectual elite. And yet, by the end of his life, Thomas Paine was almost universally reviled. This man should be a household name! An enlightening biography, it started well, and became increasingly better. It is a book that one might call a "tour de force," as it is not only a fascinating biography of a fascinating life of Thomas Paine, but it is also highly informative about his times, serving as a valuable guide to the European enlightenment, the American and French Revolutions and the controversies of the day, and also the evolution of democracy in England. There are times when in listening to a historical biography that one feels one is getting distracted by personal minutiae which would be better not to know. 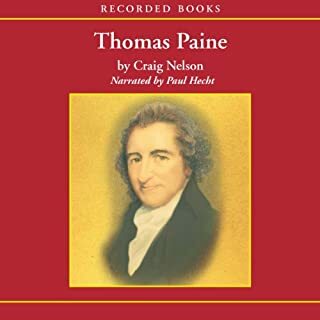 But that wasn't the case in this book because the relevant history of the period was so adroitly integrated into the personal narrative of Thomas Paine. It is certainly a book worth listening to again. The narration was superb. 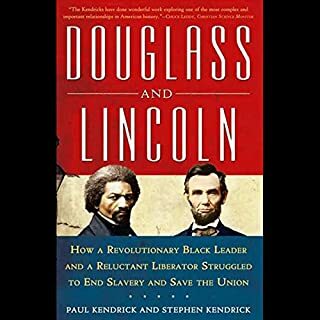 Frederick Douglass and Abraham Lincoln had only three meetings, but their exchanges profoundly influenced the course of slavery and the outcome of the Civil War. Although Abraham Lincoln deeply opposed the institution of slavery, he saw the Civil War at its onset as being primarily about preserving the Union. Frederick Douglass, himself a former slave, by contrast saw the Wars mission to be the total and permanent abolition of slavery. Very moving account and biographical portrait of Frederick Douglass and his relationship with Abraham Lincoln. The focus on the winding path of the civil war toward emancipation, and the hardships and difficulties of the emancipated slaves, coupled with the drama of the prospective soldiers caught between bloody war and a hostile society, made this a gripping book to listen to. The narration made it easy to concentrate on the text. This book has much to recommend it. John Brown is a lightning rod of history. Yet he is poorly understood and most commonly described in stereotypes, as a madman, martyr, or enigma. Not until Patriotic Treason has a biography or history brought him so fully to life, in scintillating prose and moving detail, making his life and legacy — and the staggering sacrifices he made for his ideals — fascinatingly relevant to today's issues of social justice and to defining the line between activism and terrorism. I learned much more from this title than I expected. I am interested in understanding the dynamics of anti-slavery politics that took place prior to the civil war, but I have found the topic daunting. I had read about John Brown before, with interpretations of his efforts being mostly negative, which do not explain well why he would be the subject of an anthem, or his historical stature. 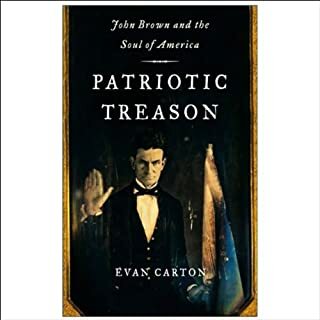 This biography puts John Brown in the context of his times making understandable the shortcomings and contrasts of other abolitionists, the urgency created by the fugitive slave law and the growing influence of the pro slavery politicians and jurists. This portrait explains well the reasons for the high regard he has been held, and his historic stature. The story of John Brown is one of a fascinating struggle with adversity, faith and the struggle of morality in politics when received opinion is resolutely opposed. The voice of Michael Prichard, with its special grit, provides a powerful and engaging performance. As America struggles with an economic debacle akin to the Great Depression, nothing could be timelier than an authoritative account of the New Deal, masterfully written by Michael Hiltzik, author of the acclaimed history of the Hoover Dam, Colossus. In this richly peopled, vividly rendered narrative, Hiltzik describes how the urgent short-term relief measures of Franklin Roosevelt’s Hundred Days evolved into a transformative concept of the federal role in American life. 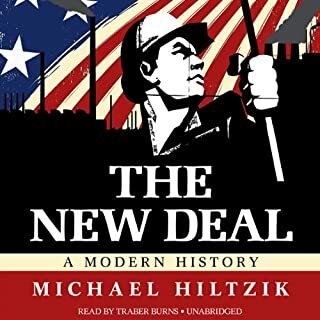 Michael Hiltzik has produced an excellent New Deal History. He brings to life New Deal personages, such as General Hugh Johnson, Harod Ickes, Adolph Berle, Benjamin Cohen and Terence Corcoran, Ferdinand Pecora; the agencies and events and professional relationships & politics they were involved in and the social climate that made their decisions, for good or ill, so urgent. The book is convincing in explaining the limits of the New Deal, and pointing out, where, with hindsight, it could have done better. The chapter on race in the New Deal years,"The Most Forgotten Man", was especially sharp and insightful. The concluding chapter is an excellent review of the politics of the New Deal, and reminds the reader why the history of the new deal is especially relevant to understanding the process of political change today. The book is beautifully written, and the gravel tinged voice of the spoken narration was perfect. 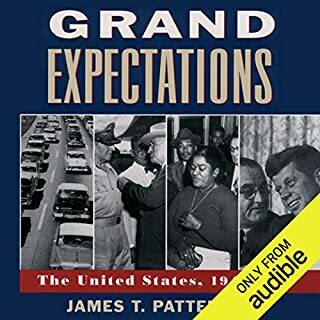 Grand Expectations, the 10th volume of the peerless Oxford History of the United States, weaves the major political, cultural, and economic events of the period into a superb portrait of America from 1945 through Watergate. This was quite an extraordinary history book. It has been a few weeks now since I've listened to it, but it left a good impression. I remember thinking that the United States has an impressive pantheon of historians. Scholars who not only write disciplined prose, but present judicious, comprehensive and thoughtful accounts of the American past. Though I did not approach this book with grand expectations, at its conclusion I looked back at it as a grand listening experience. Generally, the available variety of good books to listen to is stunning and overwhelming. Though one cannot expect an answer, the question suggests itself, because the contrast between the scholarly realm and the realm of politics on television is so vast. Given the existence of such a vast quantity of quality writing in so many humanistic fields, why is it that in the American political arena the variety of voices are so meager, and the discourse so base, and so awful? This book is a lucid and clear disquisition on what goes for "free market" thinking. 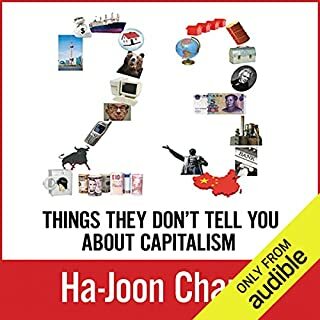 It examines 23 commonly expressed platitudes about economics and where they fail to explain economic and financial processes. It thereby provides interesting insights to the financial failures of 2008 and the present days. The reading matches the writing, making it difficult to put down. I now want to review the arguments on paper, as they are worthy of closer study. In just a few years early in the 20th century, the federal government grew from one tiny cog in the machinery of American life into a colossus, controlling the behavior of every individual. Paranoia, suspicion, and hatred of foreigners took hold, forming the mind-set with which the nation made its first acquaintance with communism in 1918. It was a seminal period in the history of the United States and the world, but the American side of the story has remained largely untold. 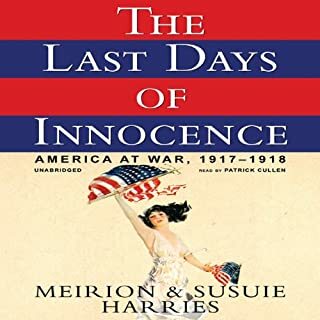 The Last Days of Innocence was a revelation and I am pleased I listened to it. In addition to being a window on an age, it provided pertinent background explaining why Woodrow Wilson's Fourteen Points and the Progressivism he purported to represent, failed to realize the hopes that it inspired.